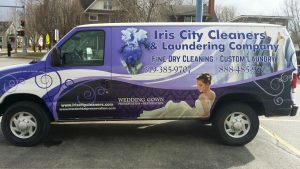 This section contains only a brief amount of information, about Iris City Cleaners and its operations. 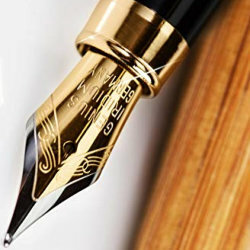 If you cannot find an answer to your question, make sure to contact us. How long does it take to have my dry cleaning done? Usually we operate on a 3 day cycle. At times certain processes take more time. Our valet services offers one day service, we also provide one day service for funerals and weddings. What can be done when shirts collar wears through? The shirt collar can sometimes be reversed providing there is not too much excess fabric on the under side of the collar. Yes, leather cleaning takes approximately 2 weeks and we use leather specialty cleaners for this process. Can anything protect ties from staining? We recommend that all men's ties are treated with a stain/water repellent, like Scotch Guard for greatest protection. Should my leather coat be water proofed? When we clean leather we, as a part of our regular service, do include a general repellency. This can be improved for a small additional cost to maximize soiling and water repellency. And we recommend it. Can I remove the care label from my clothing? The care label is provided so that both the customer and the cleaner have reasonable guidance regarding care and cleaning methods. Some cleaners decline cleaning garments when care labels are removed, others require a consent form before proceeding with cleaning. How often should I have my feather pillows cleaned? Proper caring for feather pillows depend on several factors. How often they are used, whether a protective cover or covers are used, if there is excessive perspiration causing stain and odor on the pillow? Generally an annual feather pillow cleaning is recommenced for pillows in regular use. Stains are generally of two types. One type is caused by water based substances like food and body fluids, while other is caused by oil based substances. Inks can fall in to both categories. Those that are wet side, water removable and those that are dry side, solvent removable. Specialized chemicals are used to accelerate the "freeing" of certain stains and these chemicals are generally specific to wet side and specific to dry side spotting and cleaning. Extreme care should be used in applying chemicals to fabrics. Always used a test area which is inconspicuous to see if color change will occur before proceeding to the stain area. If a problem occurs in dry-cleaning who is at fault? Dry cleaners who hold special credentials such as Certified Professional Dry Cleaner, have solid working knowledge of fabrics, chemical usage and the dry-cleaning process. They also are aware of manufacturers who repeatedly issue to the market textiles which are failure prone in wearing and or cleaning. 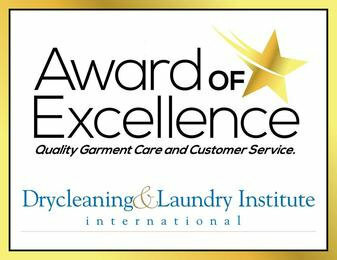 The IFI, International Fabricare Institute, the premier association for Launders and Dry cleaners maintains an extensive data base accessible by your cleaner of items sent to them analysis of problems which have occurred. Computer access of this information and related articles is available at Iris City Cleaners. Your Cleaner my decline cleaning an item based on their knowledge of preexisting problems. The Cleaners has direct access to most manufacturers and importers and can contact them for clarity on the cleaning process. Publications are periodically issued to members of IFI regarding these items. When a care label describes a cleaning process which includes "except for trim," how should the garment be cleaned? Unless the care label describes what must be done with trim, the label does not meet the legal requirements for garment care labels and should not be purchased, or if purchased and worn should be returned to the retailer. At times trim can be removed, for additional cost, and then reassembled. The Cleaners might ask the customer for a release recognizing possible problems in cleaning.